Last week my husband and I celebrated our seventh wedding anniversary. Seven years went by in the blink of an eye, so I can only imagine that this rapid passage of time is an auspicious sign for the two of us. 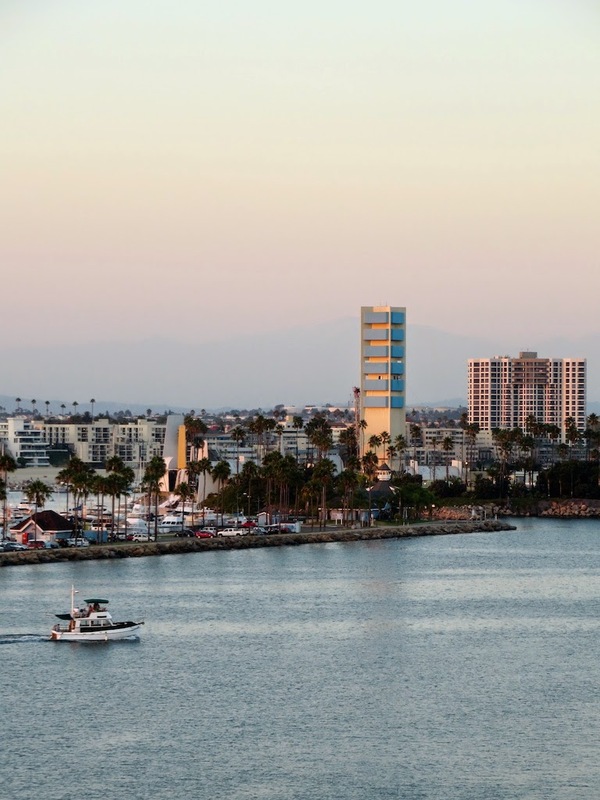 We racked our brains trying to figure out how to celebrate lucky number seven, and finally came upon the idea of dining on the Queen Mary in Long Beach. 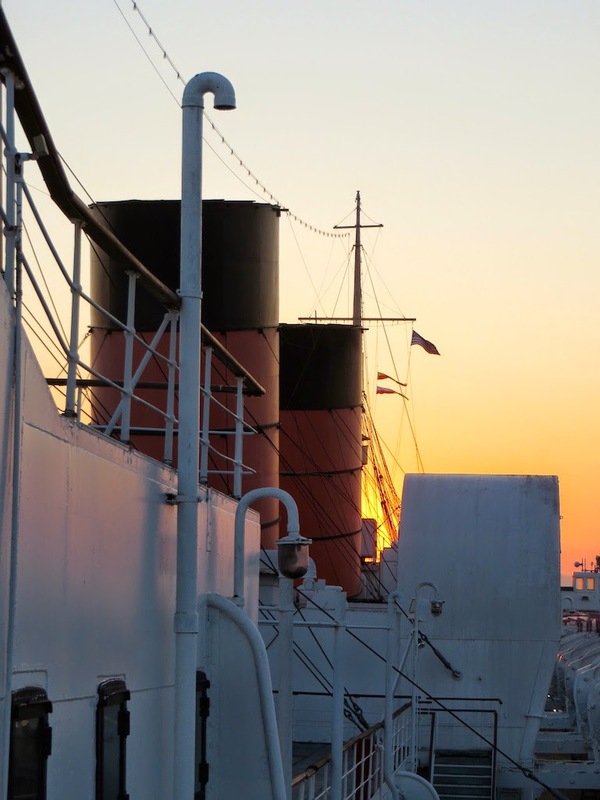 Last year we attended a "Scotch dinner", stayed over night, and had tea on the Queen Mary, all of which you can see in the following posts: The Queen and I and Low Tea on the High Seas. Since our time spent last year on board the ship was such an enjoyable experience we decided to replicate it again for our anniversary. If you know anything about me, you know I like to dress according to the occasion at hand. Since this was a nautical date, I had to make my outfit nautical as well. I have a surplus of nautical things in my closet, but I didn't want to be too overtly nautical (for example big anchors, fish etc.) 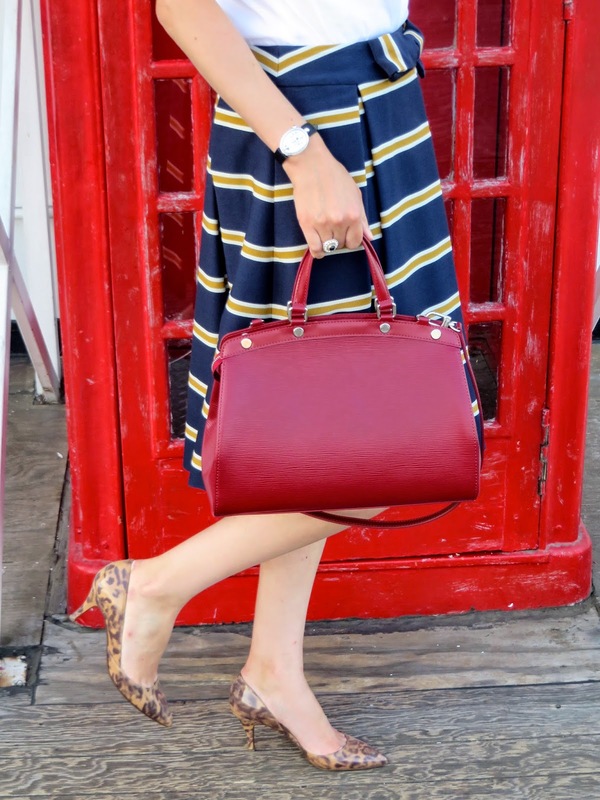 so I chose this striped blue and yellow skirt from kate spade and a pop of red to pay homage to the colors of the Queen Mary. 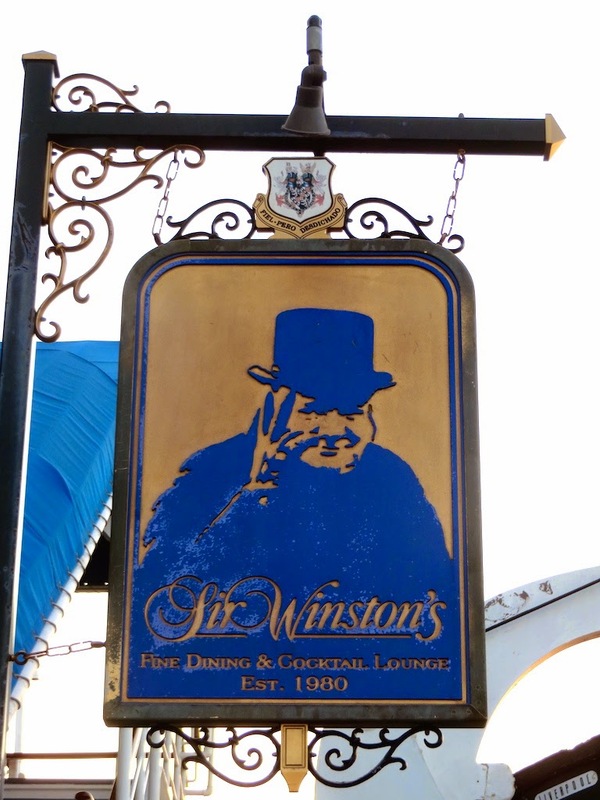 We dined at a restaurant called Sir Winston's. They have a plethora of Winston Churchill pictures and related artifacts inside to pay tribute to the former prime minister of the UK. While that's cool and all, my main interest and motivation for going to the restaurant was to try the beef Wellington, which I have never had before, but knew I would love. My husband mocked me because I was more enamored with the puff pastry than the actual fillet it encased! In addition to the beef Wellington, the view is also great from both the restaurant and the ship. We strategically planned to arrive around sunset and watch the sun go down over drinks and dinner. This was my first time taking pictures for my blog during the so called "magic hour" so please excuse the excess of photos contained in this post! 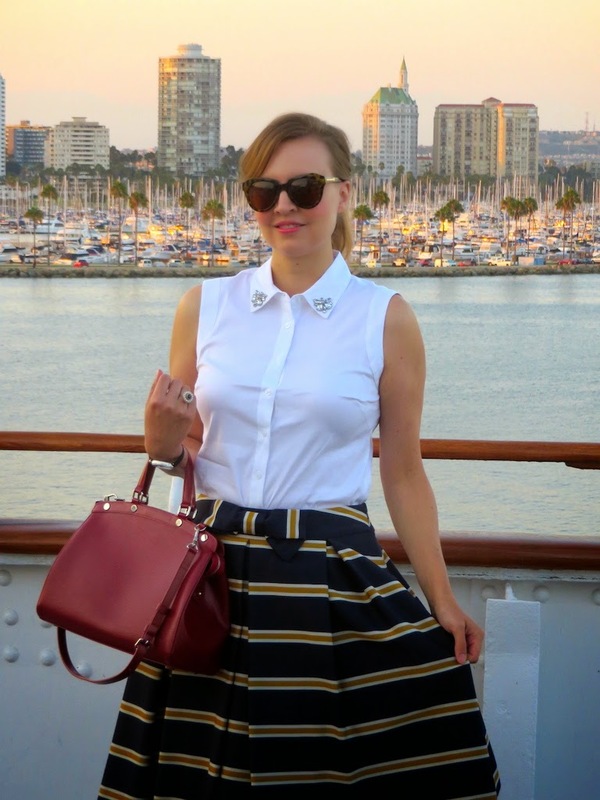 I hope you enjoyed setting sail with me aboard the Queen Mary! It's a great way to experience a time when sailing the open seas was truly a decadent and glamorous affair. (At least for the first class passengers!) All in all it was the perfect way to watch the sunset on seven wonderful years and look to the horizon for more happy years and smooth sailing to come! First off, I love bags, so I really love this burgundy LV bag! This skirt is fabulous and I really like the white top with the touches of embellishment at the collar, very ladylike! Thanks for stopping by Jess! I am also (unfortunately) a bag lover myself. It gets quite addictive! that skirt is so pretty, you matched the occasion perfectly! Thank you! This skirt is one of my favorites and I had to really work to win it on eBay. I'm a big fan of "vintage" kate spade! Happy Anniversary!! This outfit is perfect for the occasion. I love that skirt! Thank you for the anniversary wishes Nicole! I always love to pair an outfit with an occasion. Thanks Claire! 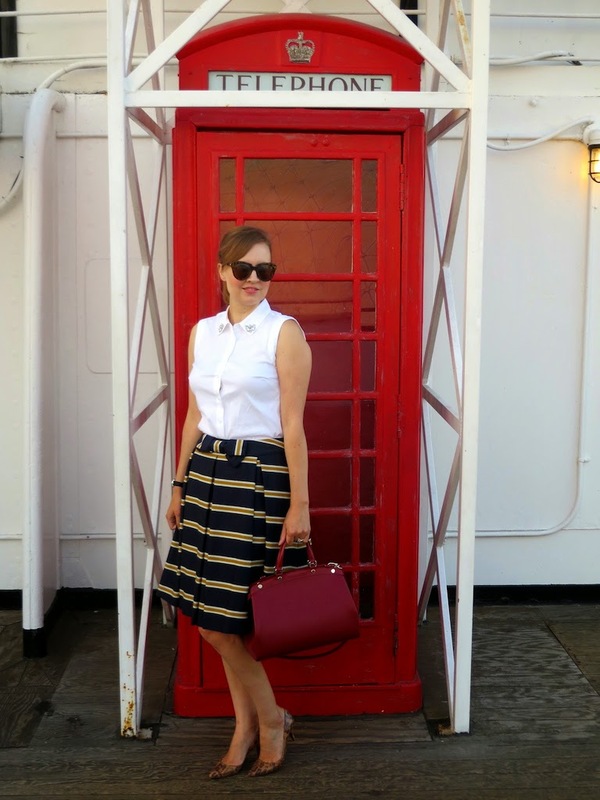 I love to dabble with the preppy, nautical look every once in a while... or possibly more than that I suppose! Thank you for the sweet anniversary wishes Laura! This really was a great way to celebrate 7 years. Happy Anniversay! What a fun way to celebrate! Your pics look amazing. Love that skirt, it looks so pretty paired with the white shirt. Classic and chic! Love the shoes and bag too! Thank you Tiffany! It really was a fun way to celebrate, not to mention a beautiful location for pictures!